A chair cheerleading class run by the social enterprise Oomph! – the activity increases older people’s physical strength and mobility. We at Big Society Capital may be almost the last people still using the “big society” banner. Big Society Capital was set up as an independent finanical institution two years ago to connect charities and social enterprises that want to borrow money with investors motivated, not just by financial returns, but also by a desire to deliver social change. Since 2012, we have received £224m from dormant bank accounts and the four largest UK high street banks. And we have committed almost £150m of this to social fund managers around the UK, who then make the funding available to different charities and social enterprises that are tackling a wide range of social issues, from the crisis in social care to huge youth unemployment and young people at risk of entering care or custody. 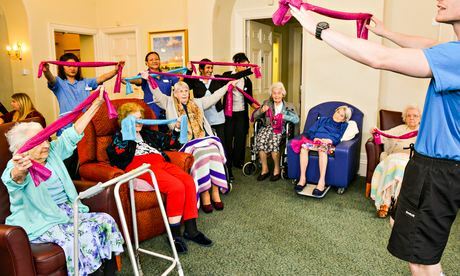 At Oomph!, a social enterprise that provides fun and effective exercise classes for older adults, social investment is being used to scale up its programmes: running specialist exercise classes, including chair cheerleading in care homes to increase older people’s physical strength and mobility. It will repay the investment through the fees it receives from the care homes. At Energise, a programme run by the youth training and education charity, Adviza, 14-year-olds identified as likely to become unemployed are engaged in regular coaching and more intensive residential programmes. The success of the programme is measured on a range of indicators, from behaviour at school to improved GCSE results. Energise is already exceeding its targets, and this will trigger a payment from the Department for Work and Pensions, funded from long-term savings to the public purse. The social investors, who have financed the programme and assumed the risk, are being repaid based on payment by results. These are just two of the 31 organisations that have received between £200,000 and £15m of social investment. But we are well aware that for many organisations taking on repayable finance, rather than receiving income as a grant or a gift, is a new concept, and it can be challenging to navigate the social investment market. We are working hard to make this process easier, and to share stories of how social investment is being used by organisations so that others can learn from their experiences. So it seems that it’s not really our name that matters. It’s what we are doing, and what we are helping others to do. via Big Capital Society is showing how successful social investment can be | Nick O’Donohoe | Society | The Guardian.